Balancing an engine requires simulating the weights of the pistons, piston pins, rings, connecting rods, engine bearings and even the oil with what is known as a bobweight (set pictured left). The bobweight accepts individual weights and is secured to connecting rod journals before the crankshaft is spun in a balancing machine. To calculate these weights, and create a bobweight, we must first look at the connecting rods and the components that appear on each end. The large end of the connecting rod, which is affixed to the crankshaft with bearings, is the rotating end. The small end of the connecting rod actually uses a reciprocating motion when the engine is operating. In calculating the weights for balancing, the rotating and reciprocating weights are used in the formula. The rotating weight consists of the weight of the big end of the connecting rod and bearings. The reciprocating weight includes the small end of the connecting rod, piston, pin and piston rings. Because the reciprocating motion impacts an engine’s balance as a percentage, that is taken into account when determining the bobweight for balancing. For example, the formula to determine a bobweight for a ninety degree V8 engine would be rotating weight grams + (reciprocating weight grams x .50) +5 grams. In this formula, 50% of the reciprocating weight was used to determine the bobweight, while five grams was allotted for the weight of the engine’s oil. An engine that is intentionally over-balanced for performance will ordinarily use a higher percentage for the reciprocating weight. For example, a V8 engine that will operate at high RPMs may benefit from an over-balance of 52%. Automotive machinists typically have their own preference of what percentage they are comfortable balancing engines at. Particularly among those who also dyno engines, while measuring vibration at various RPMs, personal preferences likely result from their own individual experiences and analysis. Because of the design of many V6 engines, a different percentage is often used in determining the bobweight. For example, many automotive machine shops prefer to balance V6 engines at 36.6%, while all out race engines are balanced at 50%. Once again, this percentage is a personal preference of the machinist who has a thorough understanding of their customer’s application. 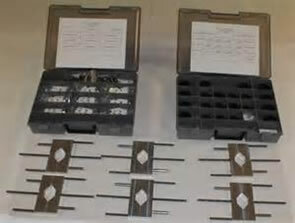 Before determining the bobweights for balancing, the automotive machinist must normalize all of the weights. In most cases pistons are manufactured to precise weights, just as the pins, rings, engine bearings and locks are. However, connecting rod weights do vary and these are often lightly machined by the shop doing the balancing so that each connecting rod has a consistent weight. 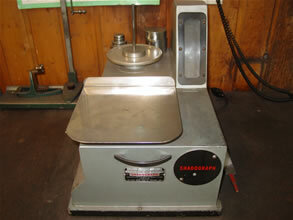 Using a precision scale, like the shadowgraph machine pictured to the right, automotive machinists may determine exact weights. Generally speaking, the connecting rod with the least amount of weight is used as the baseline for all of the other connecting rods weights to match as it is far easier to remove material than add it. Once the bobweight has been established, and the weights attached to the journals, the crankshaft may be spun in a balancing machine. This machine looks for vibration and helps the operator determine where weight should be taken off at. It is important to note that internally balanced engines, often referred to as being neutral balanced, do not need the assistance of a harmonic balancer or flywheel to balance the rotating assembly. However, externally balanced rotating assemblies must have the harmonic balancer and flexplate or flywheel attached to the crankshaft while it is being spun in the machine. As the balancing machine highlights those areas where weight needs to be removed from, the operator takes note and removes the crankshaft from the machine so he or she may remove material. Removing weight from the crankshaft is often performed on the crankshaft’s counterweights using either a grinder or Bridgeport milling machine. For those crankshafts that have been knife edged, this can make balancing even more of a challenge since the counterweights have been narrowed. Regardless, weight can be taken off as needed to balance the crankshaft. There are some cases where adding weight to the crankshaft is the best option. Using mallory metal slugs, which is often referred to as heavy metal, are often installed into the crankshaft’s counterweights after holes have been machined to accept this material with a press fit. Because of the cost of mallory metal, and the labor needed to install it, most automotive machinists try to avoid using this material at all costs. Once the crankshaft has been balanced, the bobweights are removed and the crankshaft is then polished to remove any marks caused by spinning the main journals in the balancing machine. After this is completed, the customer should be provided with a copy of their balance card so that they may have access to this data in the future as needed. Especially in the case of performance engines, being able to replace a piston or connecting rod with the same weight can often save the customer hundreds of dollars and reduce the time it takes to make repairs to the engine. Now that you have learned more about balancing an engine, please take this opportunity to help us improve our website by rating this page below.